We wanted to touch base to ask if you would please share the information below regarding Dave Ramsey's support of our program, & our Facebook page & Twitter feed links with your PreK - 12th grade families as an additional resource for their college-bound students. 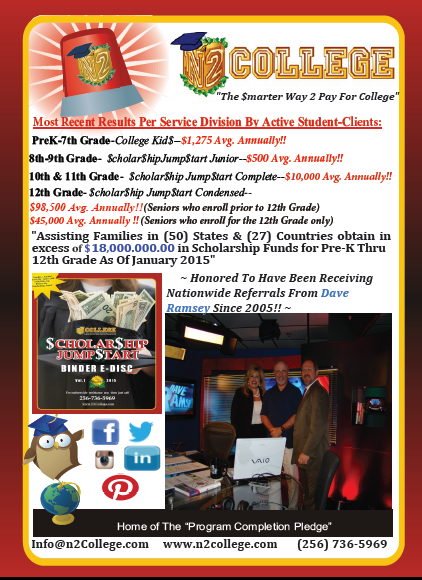 To thank you for sharing this information, we are offering your families Comprehensive Service in the "$cholar$hip Jump$tart" Merit Funding Program for their 2015-2016 grade-level(s) of choice for $99.00.This offer is valid for a limited time. Thank you in advance for sharing our links & 2015-2016 enrollment offer with them, & we hope that your year has been great so far! Jill Gudger Howell, M.A. Ed. Presenter, The College Board-National (Chicago) & Southeast Regional (Atlanta) Forums-"Trends In Guidance Technology"
Past Executive Board & ASCA Nominee, The Alabama School Counseling Association, "Emerging Leader In The Field"
As Heard On The Dave Ramsey Radio Show: “The Smarter Prek-12th Grade Way To Pay For College"